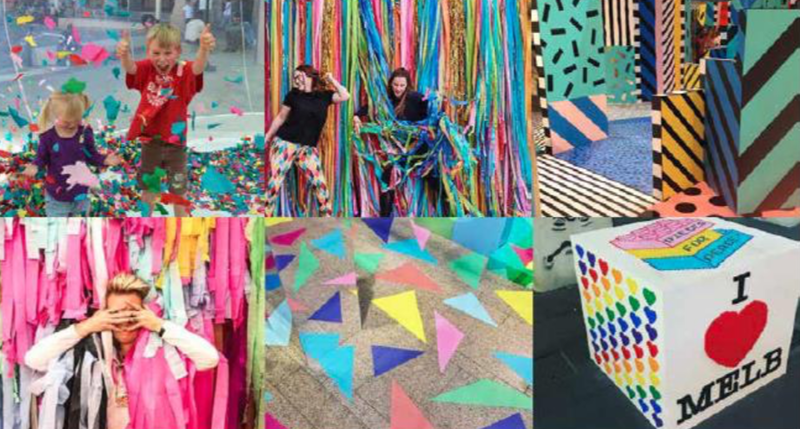 Western Australian Artists are invited to submit their Expressions of Interest for a series of four (or possibly five) Temporary and Ephemeral Artwork Commissions for the Belmont Forum Shopping Centre to be scheduled over the next 12-15 months. Please see the attached Artist Brief below for more information. Please contact Paul with any further enquiries. What a fantastically liberating and uplifting project to be part of. Certainly this project was not without its challenges, as there were many, but it’s amazing what one man’s true grit, determination and dedication to his vision can achieve. In saying that the local community support particularly from Kevin Mack and the Friends Of Claughton Reserve has been extraordinary. Kevin who has been involved in and believed in this project from day one including being on the initial selection panel has provided steadfast support even during the difficult periods. He wrote letters, attended meetings,, provided much need nourishment and spoke enthusiastically and persuasively about Duncan’s progress whan all was getting hard, even getting on the tools and providing many hours of labour assistance to Duncan over the journey. Thankyou Kevin for your support of this project and Duncan when he needed it most. I must also thank the City of Bayswater and particularly Jeremy Maher who was tasked with overseeing this project. Jeremy was the one who got onboard and had to take back this ambitious concept and convince the local government hierarchy to back it. No doubt this took some doing but Jeremy got it through no doubt regaling the passion and determination that Duncan was projecting. The decision to support and back this project was bold, progressive and took some courage, many traits that are often hard to apply to local government but in this instance and has been demonstrated since, the City of Bayswater is a progressive local government that will consider and importantly implement creative thinking and community driven initiative. Duncan’s initial Concept Presentation was bold, challenging and asked alot from the selection panel. It was as exciting as it was contradictory, it was passionate but was it feasible? Was it possible for Duncan to pull off such an ambitious vision? It took a second round of Concept Development for everyone’s understanding to come together and some convincing explanation and argument from Duncan but then… then he got the go ahead! There was a lot of remedial work that had to be one first to ensure the building was going to be sound as it still had to provide important functionality. Once Duncan got rolling however there was no stopping him. In fact the project took Duncan twelve months of hard labour. Living away from his home and family on the south coast for such an extended period of time is no small feat in itself. Duncan worked tirelessly, 7 days a week from pretty much dawn to dusk to create what you see now. It was this dedication to the project that the panel saw in Duncan at selection, it was this same determination that saw the project through to completion. There were plenty of complications and hiccups along way, there always is, but even when battling exhaustion and very difficult financial constraints, Duncan continued on and found away. There was a lot of support from many and varied sources that no doubt helped but one man was in the end responsible and that one man kept plugging away determined to complete the work. The thing that struck me most even when the project was at its most difficult stages, Duncan stuck to his vision. There was to be no shortcuts, no cheaping out on process, materials or the labour required. In the end it is this incredible attention to the smallest details that makes this project just so successful and a project that will stand the test of time for many decades to come. Well done Duncan, total respect has been earned! Measuring 4.5 metres high by 9 metres long and 4.5 metres wide, The Nearest of the Faraway Places combines public artwork with a public toilet and has put the commissioning body – the City of Bayswater Perth Western Australia – on the global map of the emergent trend of toilet tourism. The design reflects the river location with references to the endangered western swamp tortoise, egrets, fish, gnomic growth patterns and the kangaroo paw plant. The palette is lightweight concrete, stucco, ferro-cement, glass, oxides, paint and stone. The commission required the creation of a vital link between the location of the Claughton Reserve riverside park and the upgrade of a humble utilitarian building through transformative artwork to the exterior of the facility. The result is an architectural experience where visual ideas are expressed through the disciplines of art and design, architecture, engineering, history, construction and mathematics. This re-imagining articulates a sense of place and visually redeems the public toilets through the sublime geometry of Platonic form, ably corresponds with its environment, transcends social hierarchy and provides an other-worldly pavilion for very worldly functions. A perceived irrational appearance, mitigated by necessity, is paradoxically both site-specific and exotic. In fact, a series of architectural contradictions are apparent; a floating granite carapace dome, flat walls that spiral with spirals based on squares and the cornice can barely contain the rhythm and energy of the walls. However, all these are resolved by underlying geometric imperatives, compositional principles or contextual references that work to produce and maintain aesthetic cohesion between the parts and the whole. The collaborative nature of the work was between the artist, Artsource – Western Australia’s peak government arts body – and the City of Bayswater, a municipality within the state capital Perth. The project was part of an overall master plan for the upgrade of the Claughton Nature Reserve, a small park on the banks of the Swan River. The City of Bayswater Council commissioned the work through Jeremy Maher and Paul Parin of Artsource facilitated the project. Local steel workers Manny Arkveld, ACB, Wenco and Federal Metal fabricated the steel frame armatures, MCM batched the lightweight polystyrene concrete and Haymes Paints provided the paint and anti-graffiti sealant. The Friends of Claughton Reserve were instrumental in initiating the commission and an enthusiastic volunteer labour force. The work is a modern day iteration of Roman classical architecture with its spheroidal domed roof and the walls as the modulus. The spirit of Vitruvius is invoked in threefold symmetry [reflective, rotational and radial] and eurhythmy [mathematical harmonies uniting the parts and whole]. Pi, the golden mean, 1: root 2, the octave, perfect fifth and a hexagonal tessellation ensure rigour, composure and restraint in a building that otherwise appears free-spirited and improvised. After a full 12 months of grind and effort, The Nearest of the Faraway Places was complete. Duncan was truly physically and mentally exhausted but immensely proud knowing that he had somehow managed to see his way through and create an artwork that was something truly special and unique. Already months before completion and indeed from the early days of the transformation there was a growing public interest and curiosity as Duncan’s work progressed and word started to spread. In turn there was media interest including a very interesting interview with ABC Radio National. The project was opened in February 2018 by the City of Bayswater Mayor, Cr Dan Bull on a beautiful summer afternoon and the event was very well supported by dignitaries, visitors and all manner of project supporters including City Of Bayswater staff. Possibly most importantly was support from a great local community entourage who in true community spirit provided a celebratory sausage sizzle. Duncan is now back home in Torbay, catching up on lost time away from home and is no doubt working towards his next project. This post marks the start of the next chapter in my story as a creative arts professional. For the last few years I have been managing so many awesome public art projects for Artsource as a Senior Arts Consultant. Today I start the exciting journey of managing these projects for my own fantastic clients in my very own consultancy. A WordPress Commenter on Welcome to Artefact Creative!